I have a question regarding the operation of power lift gate. The way it works on mine is, I walk up to the rear, lightly hold the handle to unlock it and pull hard for several inches (may be a foot) and then it automatically opens. Is it how it's supposed to work? I recently saw a YouTube video where a reviewer simply holds the handle lightly and the door opens all by itself. I didn't see him pulling at all. Is mine not working as intended? How does the power lift gate work on your cars? Simple touch or pull hard. Thanks guys. Push the button on the remote. Or, push the button on the dash. Or, push the button on the door itself. I have a 2013 and the struts are both leaking oil. I'm sure they have lost a lot of their pressure inside. I do not think by grabbing the handle, the "power opener" is activated. My power opener only works with the remote, or the button on the dashboard. Look for oil dripping from the struts. Maybe Sachs made the struts too!!! 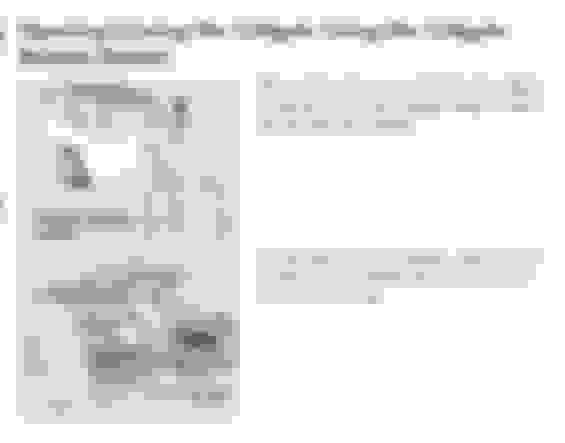 Last edited by rosen39; 01-28-2016 at 09:51 AM. Pushing the buttons on the handle only unlocks the lift gate but doesn't move it. I still have to pull it hard a few inches (against resistance) for the electric motor to activate. I don't see any oil dripping anywhere. Of course I can always use the key fob or button on the dash/ door, but that's not the point of this thread. Thanks. The button on the handle should work the same as any other button that opens the door. Small button on mine only "locks" all the doors. It does not activate the "power open". Large handle does not activate the "power open" either. I have two buttons. One activates the power liftgate and the other locks all doors once the liftgate is closed. So I'm guessing that everyone's button works the same. One for locking the car and the one which unlocks all doors including lift gate. "After unlocking" do you have to pull hard to open the lift gate or does it open without much effort? That is my question. I'll try to find the you tube video. You shouldn't have to pull it at all. It should simply be that you press it and then let go and it rises on its' own slowly. I would say take it in and have them look at it or go to the dealers and see other models on the lot. If this is a weak motor, it may fail right out of warranty, so get it done now. 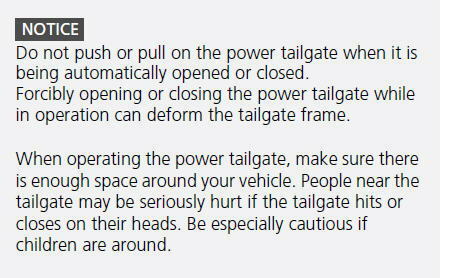 If you pull on the handle (on the liftgate) briefly and then release, the tailgate will open under it's own power. If you pull the handle and hold it, you will hear two beeps, and the tailgate will be in manual mode and you open it like any other tailgate. And just like any other tailgate, when it is approximately half way up, the pressure in the cylinders will be able to lift it the rest of the way without any additional effort from you. I always use the manual mode while inside my garage so that I can control the amount of opening and avoid hitting the garage wall. Edit: There is another small button located near the liftgate release ( very similar to the lock button on the drivers door) which will lock all 5 doors when pushed. Last edited by RDX-Rick; 01-28-2016 at 12:27 PM. If you have the navigation system installed, you can choose if the tailgates outer handle is in the "off" mode (Manual operation only) or in the "on" mode which gives you the choice of Power/Manual as described in my previous post. This selection can be located under "vehicle settings". ^ Good to know. I had the same question as OP. I will check out the vehicle settings. This video does not indicate that grabbing the lift gate handle will activate the motorized "open" function. I still think the pressurized gas struts are what opens the lift gate. Do you actually hear the motor working on the "open" function? You video did not even touch on the subject of opening the tailgate from the exterior handle. I don't recall hearing a motor in either the open or closing mode, and I know a motor is involved in the closing mode, so the motor is quiet enough to be unnoticed. 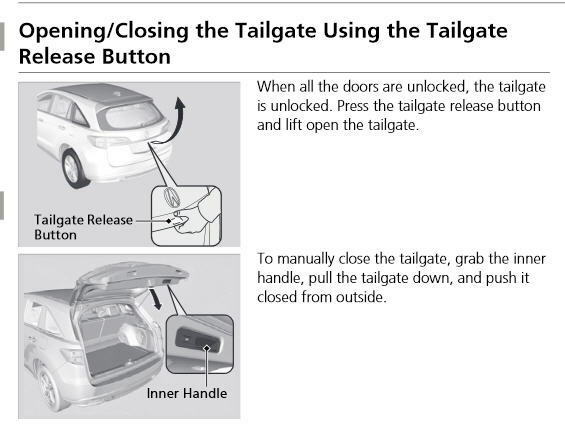 When opening the tailgate in the manual mode (by holding the handle more than 1 second) it will not rise by itself until it is pulled up to 1/3 to 1/2 opened, so it is unlikely pushing a button will cause it to rise from the closed position without the assistance of a motor. And finally this warning in the owners manual seems to indicate that manual operation of the tailgate should be avoided once automatic operation has been initiated. I would assume this is because motors and gears are involved. Update: Sorry about this incorrect statement. The tailgate on/off setting is available without the navigation system as well. "Your video did not even touch on the subject of opening the tailgate from the exterior handle." That is what i'm saying. I don't think (at least the 2013 model) has a "power open" by grabbing the handle. My old Lexus RX had this feature, and I remember not being happy about the RDX not having it. When you use the remote to open the hatch, you can hear the motor working. I also could not find any tailgate setting for the handle to be "Off" or "On" for power operation, and I have navigation. 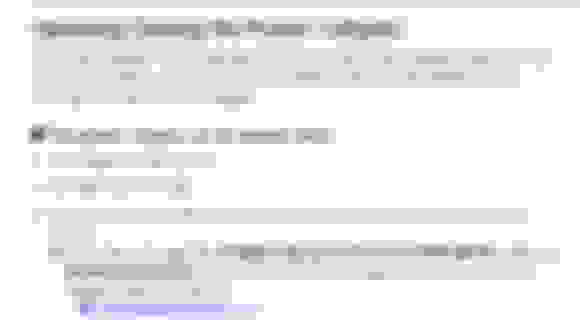 Last edited by rosen39; 01-28-2016 at 04:09 PM. That is what i'm saying. I don't think (at least the 2013 model) has a "power open" by grabbing the handle. ...... When you use the remote to open the hatch, you can hear the motor working. That may be correct, but I'm afraid I have no experience with any of the previous versions. I am surprised that the older models would not have this feature since all the electronics and mechanics are already installed. They only need to add a switch that gets pushed when the handle is lifted. Optionally they could just add a push button in the sheet metal for the same purpose. So in fact my information may be incorrect for the OP (Comfy) because I have no idea of what model RDX he has. I suggest that all members add this information to their profiles, or add it to their signature line as I have done. Last edited by RDX-Rick; 01-28-2016 at 04:14 PM. Push the hard button labelled "Settings"
Rotate the round control to select "Vehicle Settings" in the upper display and then press to select. Push the round control to the right in order to select the tab "Power Tailgate Setup"
Push the round control downwards to select "Power Open By Outer Handle"
I don't think (at least the 2013 model) has a "power open" by grabbing the handle. I downloaded your owners manual and found conflicting information on this subject. 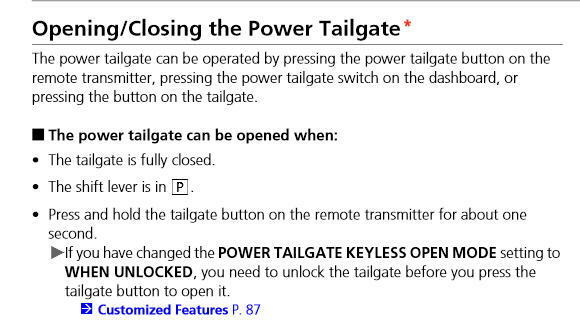 In the first section it says the power tailgate can be operated by pushing the button on the tailgate. In the second section it says you need to press a release button and then lift the tailgate by hand. There is also an option for the button on the hatch to only work if the doors have been unlocked first. Have you tried using the rear hatch button after first unlocking the doors? In the 2016 the power release and manual release are the same "handle", only the amount of time it is held determines if the hatch will open in manual or automatic mode. Is it possible your 2013 has 2 separate buttons?. I have seen other SUV's that have a small rubber covered button in the area of the release handle. Does your 2013 have a button on the interior side of the tailgate for closing the hatch under power, or have you been using the keyfob for that purpose as well. The manual did not indicate that setting was available on the 2013. The only pertinent setting was for the button on the hatch to work always or only if the doors are already unlocked. I have a 2015 RDX w/Tech and have observed the same tailgate behavior as the OP. After comparing owner's manuals between the 2015 and 2016 models, I came to the conclusion that the tailgate release 'inner handle' on the 2015 does not activate the power tailgate feature. It merely unlocks the tailgate. The user must then lift up on the tailgate to open it. The FOB button or dashboard button are the only means available on the 2015 to activate the power-open feature. I later came across a video on YouTube explaining 2016 RDX changes relative to the 2013-2015. Among those talked about are an upgrade to the power tailgate whereby the power-open feature can be activated by a simple press of the tailgate release inner handle. He then proceeded to demo it. So, it appears that for whatever reason Acura chose not to include this feature on the 2013-2015 RDX models (at least in the US). I believe it is included on MDX models for the same period, so the parts would have been available. Seems like a pretty chintzy omission to me. "Seems like a pretty chintzy omission to me." Just add it to the list including power height adjustment passenger seat, rain sensing wipers, roof rails, wood grain dash, body side moldings, etc, etc. I see. So that there is the problem in its entirety. Now I can sleep easy that my RDX is not broken. Acura just decided to skimp on features for our model year. I have the 2014 model. So essentially everything is the same as 13-15 models. The video I saw was the 2016 RDX review, I think one from the "RDX AWD is useless" debate thread. Thanks everyone for chiming in so that we could get a proper conclusion. That was some real good detective work . Last edited by Comfy; 01-28-2016 at 08:34 PM. I can't tell you how many times I have purchased a new vehicle, and then felt cheated because the next years model had a few new features. I'm sure I will get this feeling again next year. So if it makes you feel any better......The only time I use the power feature of my 2016 tailgate is either from the key-fob or the dashboard button. I find that if I am already standing at the rear bumper, it is faster to open the hatch in the manual mode rather than waiting for the motor to raise it. It's not like it takes a lot of strength or anything. I also usually close the hatch manually and lock all 5 doors using the button on the tailgate, but sometimes I will use the interior power-close button (on the bottom edge of the hatch) and walk away while the hatch is closing. In this case I need to remove the key-fob from my pocket and lock the doors from a distance. I have a 2013 I just purchased in August 2017. Thank goodness I found this thread. I was wondering the exact same thing. This whole time I thought my power lift gate was messed up. I can power open the lift gate from the dash inside and using the key fob just fine. However, when I'm trying to use the lift gate button outside on the rear, I actually have to press it to open, then give it a slight tug for it to open up fully. I found that very odd for a car that has the power lift gate option already. My assumption was, shouldn't I just be able to press it, step back, and let the power lift gate work its magic??? Like come on! I did learn something new, I never new there was another button to lock unlock in the rear. You learn something everyday. Don’t you? Can you locate the video you mention here? Thanks! I was also relieved to come across this thread. Seems like such a counter-intuitive "feature" that the liftgate (which is, after all, powered), would not lift automatically with the touch of the button. Oh well, at least I know it's not broken. Thanks!